Your choice to volunteer with Council greatly enhances the services that we provide and our volunteers play a vital role in creating a vibrant community in Lismore. To volunteer with Council you must be at least nine years of age. Volunteers under the age of 18 must be under the strict supervision of an adult parent or guardian at all times while volunteering with Council (this is different for student placements), and work with Council staff who have completed a Working with Children Check. Volunteers over the age of 90 will be assessed on a case-by-case basis and can be asked to provide a doctor’s certificate stating which duties they are fit to perform. Council’s insurance provider currently does not insure individuals over the age of 90. If you would like to volunteer in any of the above areas phone us on 1300 87 83 87 and ask to speak to the Coordinator of that particular area (i.e. Events). Let the Coordinator know you are interested in volunteering and they will tell you if there are any volunteer positions available now or coming up in the near future. The Coordinator will then ask you to complete a Registration Form and an Engagement Agreement. It will be very important that you read and thoroughly understand Council’s Volunteer Program Policy, Procedure and Handbook below before commencing with Council. Please ask questions of your Coordinator if you do not understand any documents provided to you. We hope you enjoy your experience volunteering with Council. The Community Pride Trailer is available free to community groups who would like to undertake working bees or special community projects. People using the trailer must be registered volunteers of Lismore City Council or an incorporated community group. The trailer is not available for private or commercial use. The equipment is to be used on Council-owned land and not private property and for its intended purpose in line with correct Work, Health and Safety standards. If you are not sure how to use any of the equipment please let Council staff know at the time of collection. There are no power tools provided on the trailer due to Work, Health and Safety standards. The trailer can be collected from 116 Brunswick Street, Lismore (our depot) on Fridays between 8am and 3pm and can be returned the following Monday between 8am and 3pm. If you need the trailer outside of these times please mention this at the time of booking and someone will get back to you. A key will be issued to you at the time of borrowing and the trailer is to be kept locked when not in use. What is the date and time that you will collect the trailer (between 8am and 3pm)? What is the date and time that you will return the trailer (between 8am and 3pm)? What is the name of community group booking the trailer? Is the community group an Incorporated body or are the members using the trailer registered volunteers of Council? What is the name and contact number for the person responsible for the trailer? What is the name and contact number for the person collecting the trailer (if different)? What is the current NSW drivers licence number of the person collecting the trailer? What is the vehicle description and registration number of the person towing the trailer? Is the vehicle towing the trailer comprehensively insured? What is the address where the trailer will be stored? Do you agree to use the equipment for its intended purpose and in line with Work, Health and Safety standards? Do you agree to report any broken, damaged or missing items upon return of the trailer? Please note that Council reserves the right not to loan the trailer to a community group after an adverse event (e.g. misuse of equipment). 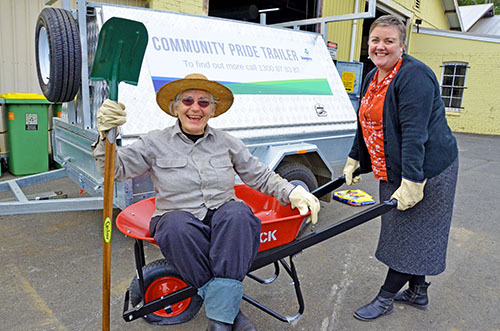 We hope that this Community Pride Trailer helps community groups to love and care for community assets and see them preserved and enhanced for everyone to enjoy. If you would like to suggest other items for the trailer or offer any feedback, please phone our Partnering and Community Engagement Team on 1300 87 83 87.